In 2013 we had the inaugural Full Moon Beach Run and after the event success, many runners have since added this run to their bucket list. On 6 December 2014 the stars, full moon and low tide combine perfect once again to host another one. The request was to add a shorter version as well and we therefore added a 6km run as well. 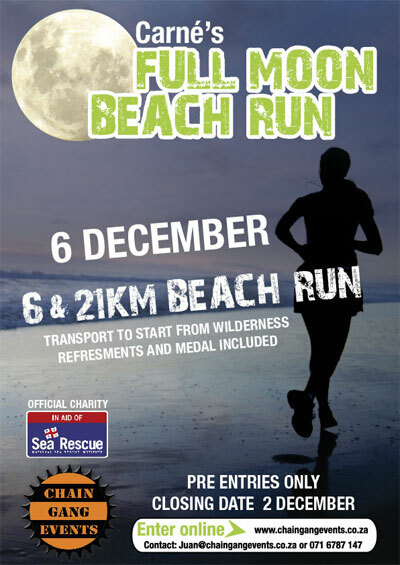 Chain Gang Events again in partnership with Wilderness NSRI, the event’s official charity, want to help you tick this one off your bucket list, and run on what’s been described as the best stretch of beach in the country! Join us on the evening of Saturday 6 December. Runners will be welcomed with a coffee at registration at the Wilderness NSRI before being transported by the organisers to the start (21km runners to Swartvlei and the 6km runners to Kleinkrantz). Your car will be safe at the finish. Runners need to have all of their standard trail running hydration and safety equipment with them en route. The refreshment stop will be a welcome top-up approximately mid-way. Medical assistance will be available on route. Starting at Swartvlei Beach, the 21km runners will pass Gericke’s Point, the rocky landmark resembling a lion’s head. Thereafter enjoy kilometers of mixed sand and rock shelves with the warm Benguela current on your left and the fossilised sandstone dunes towering above you on your right. Passing Kleinkranz village (the 6km Runners starting point) and a mid-run refreshment stop, runners then reach Flat Rock and a few more kilometers of sand running to the finish at Wilderness NSRI. The Wilderness NSRI base will host the finish where runners will be greeted with medals and refreshments, and an opportunity to share this amazing experience with fellow runners and family. Since last year, the wife of the race director (Juan Botes) lost her fight against cancer and in memory of her (last years' runners would have met her at the refreshment stop at Kleinkranz) the race will be named after her, as it was her favourite stretch of beach. Come and enjoy the experience and support a worthy cause. Registration will start from 16:00 - 18:00 on the Saturday at the Wilderness NSRI office. This is a pre-entry event only (unfortunately no late entries) and entries close on the 2 December 2014 or when the 200 runner limit has been reached.